Remember last week’s OT Thursday post, when I said that I finished Season 1 of How I Met Your Mother the Saturday before that? Well, I finished season 2 that same weekend. I always get hooked into marathons! I loved it just as much as season 1 (maybe even more than season 1) and actually caught a few episodes that I somehow missed when I originally watched the season on TV. Naturally, I’m eager to share my thoughts… so this OTT is, again, dedicated to How I Met Your Mother. World’s Greatest Couple (Episode 5) – In this episode, cute and sweet Lily moves into ladies man Barney’s apartment because she hasn’t yet reconciled with Marshall. In the beginning it seems that the arrangement will benefit both of them – Lily doesn’t have to share a creepy apartment with a terrifying rat anymore, and Barney can pretend Lily is his wife in order to scare ladies away from the place “the morning after.” This premise itself is very funny considering how completely different these two characters are, and it all plays out hilariously as well. Swarley (Episode 7) – There are two hilarious things about this episode: the nickname “Swarley” with its many variations (the best of which, I must agree with my sister, is “Swarles Barkley”), and the crazy eyes. The “Swarley” bit is kind of a running joke that takes a back seat to the storyline of Marshall’s crazy-eyed new girlfriend, but both of these situations work together to bring the audience a whole lot of laughs. How Lily Stole Christmas (Episode 11) – Disgruntled Lily is hilarious, and I can’t help but marvel at her ability to elaborately decorate the apartments (which means three set-ups and two take-downs) before Marshall returns at 5 pm. Toss in Ted’s super-religious relatives, silly curse word substitutions and the subplot of a whiney Barney dealing with a cold and you’ve got a very funny holiday episode that gets wrapped up in a sweet ending, as usual. I didn’t live through the ’80s, but I still regard all of the cheese of the decade very fondly. It is revealed that Robin was a Canadian pop star in the ’90s, and the Canadian ’90s happen to look a whole lot like the American ’80s. Her stage name was Robin Sparkles. Her big hit song? “Let’s Go to the Mall.” The reveal itself brings the laughs because Robin’s friends automatically assume that she was involved in worse things than cheesy pop music, and the scene comes complete with an absolutely hilarious music video (which you can view above, courtesy of the CBS youtube channel)! Ted finds a penny while riding the subway and discovers that it’s from 1939. This is a very brief and simple scene, but I love it for a few reasons. I must admit that it reminded me of myself a bit, which is one reason that the scene stood out to me. I get geeked out over not only old coins, but old things in general. Magazine from 1943? I’ll squeal like a 12-year-old at the latest pop heartthrob’s concert! Camera from the 1910s? I’ll faint from excitement! I also think the scene, though quite short, does a great job of reaffirming what type of person Ted is and what his personality is like. Viewers who made it to season 2 would already know that he was a bit of a nerd (which, in my opinion, is a good thing), and this is just yet another moment that confirms it. Marshall’s all set to get married to the love of his life… but he’s having an awful hair day. First, Lily’s cousin gives him awful frosted tips. Then, in a rage-filled attempt to remedy the issue, he shaves off a huge section of hair right in the middle of his head. In attempt to cover up the newly bald spot, Barney snatches a man’s toupee, which looks hilariously awful on Marshall. Ted, Barney and Marshall think of just about every solution except the most rational one – a simple hat! – to remedy Marshall’s bad hair day, and Jason Segel portray’s Marshall’s dismay perfectly in this part of the episode, making it one of the funniest of the season. This wouldn’t be a list made by Lindsey if it didn’t include a bit of sap. The scene where Marshall and Lily quickly marry outside, officiated by Barney and witnessed by Ted and Robin, is one of my favorite moments in the whole series. 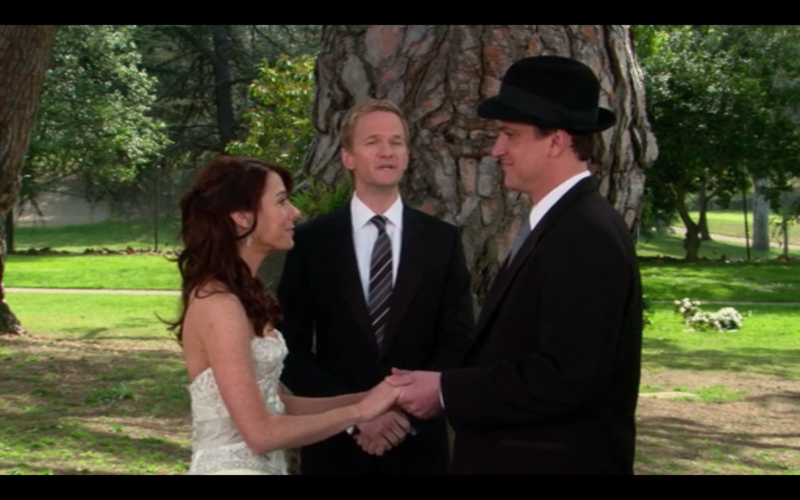 It’s funny because of Barney’s overly emotional reaction as he attempts to officiate, but also extremely sweet because Marshall and Lily get what they originally wanted: a small outdoor wedding, accompanied by great friends, with an acoustic guitar playing in the background. I love Marshall and Lily, so this scene always kills me with cuteness! I love HIIMYM! How far along are you now?